A huge chunk of Hawaii’s famous Kamokuna lava delta collapsed into the ocean on New Year’s Eve. Twenty-two acres of the 26-acre ocean entry crashed into sea, taking the viewing platform along with it ‒ and was nearly disastrous for five tourists. The lava delta, which is within Hawai’i Volcanoes National Park, began collapsing around 2pm local time on New Year’s Eve, causing an explosion of steam and a shower of volcanic rock to burst into the air. The hot lava meeting the cool water caused a highly corrosive plume of hydrochloric acid, resulting in the temporary closure of airspace 1,000 feet above the island while the US National Park Service secured the region. "Fortunately, there were no aircraft or boats reported in the area at the time of the collapse, nor were any visitors on the delta itself, which is closed for public safety," said Park Superintendent Cindy Orlando. "Had anyone been close by on land, water or air, lives would have surely been lost,” she added. Rangers closed off access to the delta shortly after it began collapsing. However, at about 7pm five eager tourists ducked below caution tape and ignored warning signs to get a closer look at the coastal cliff. 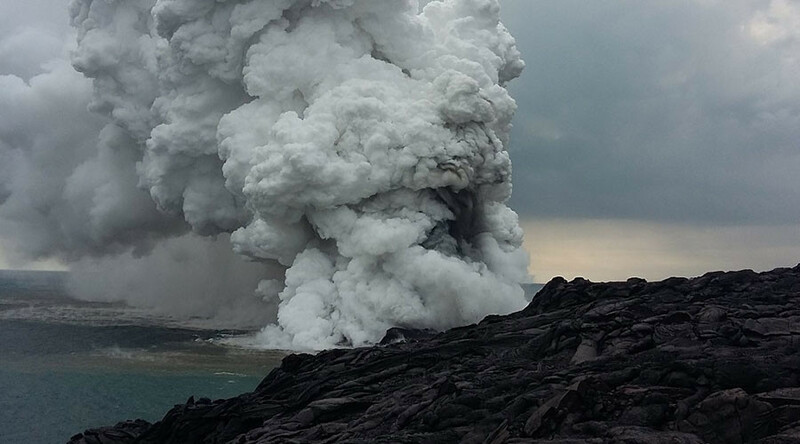 "It was a really close brush with death for them," said eruption crew ranger Travis Delimont. "Luckily, they finally listened to us and turned around in time." Lava deltas are formed when lava hits the ocean and cools, forming fragments that eventually build into an unstable and hazardous surface.